Pedro Bhering has over 35 years’ experience dealing with multinational corporations from the United States, Europe, Asia and Latin America in all issues regarding intellectual property. In this regard, he is familiar with US and European legislation. Mr Bhering specialises in trademarks, licensing and technology transfer, copyright and neighbouring rights, enforcement against unfair competition and counterfeiting, and civil litigation. Mr Bhering is also responsible for the strategic management of the firm, as well as for the construction, consolidation, maintenance and expansion of an international network of associated law firms that maintain long-lasting professional relationships with Bhering Advogados. the European Communities Trademark Association. 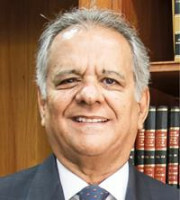 He is consistently recognised as a leading lawyer in Brazil in intellectual property by renowned international publications such as Chambers and Partners Global, Chambers Latin America, Who’s Who, Legal 500, WTR 1000, IAM Patent 1000, Leaders League, Managing Intellectual Property, WIPR Leaders and the Brazilian reference publication Análise 500. Mr Bhering is the author of several articles on intellectual property in specialist national and foreign journals and reviews, such as Aspatore Law Books, Managing Intellectual Property, World Trademark Review, World Intellectual Property Review, Getting the Deal Through, the Valor Econômico and Jornal do Comércio newspapers. He speaks Portuguese, English and French.